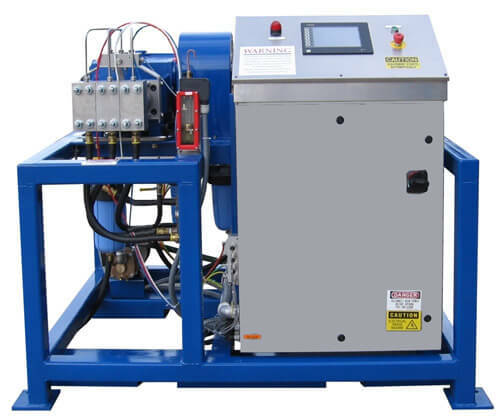 These cold water blasting machines are available in diesel or electric models. All come complete with a basic accessory package to include gun, wand, and ultra high pressure hose. Some models feature anoptional sand blasting media pot for wet sandblasting. Models are capable of variable speed control to effectively vary pressure settings from 5,000 psi to 15,000 or 40,000 psi depending on the model. Equipped with a variable speed pump drive, and through the use of an 8” color graphics touch screen, the operator can digitally set the desired pressure set point and watch the drive adjust pump rpm and pressure. The pump starts and stops upon activation of an electronic gun trigger. This technology saves money by not consuming water, electricity or wearing out the pump until the operator activates the trigger. All machine diagnostics can be accessed through the color touch screen making the troubleshooting of this system a snap. 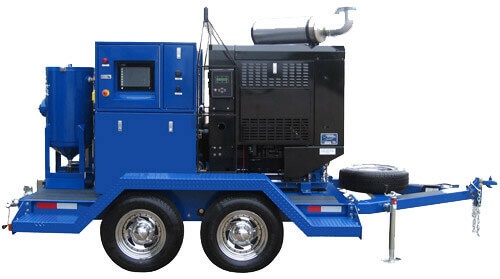 Cold water blasting units are either electric or diesel driven. Mounting options are skid, trolley, or trailer. Safe, Effective, Quiet Operation - Electric models emit low noise relative to diesel counterparts. Electronically Maintained Pump Setting - Allows for easy variable pressure setting for multiple applications. Long Life, Heavy Duty Triplex Plunger Pump - Electronic pump controls reduce wear on pump. Durable Materials & Design to Minimize Wear - heat treated stainless steel, limits wear and tear of parts. Fault Indicators for Enhanced Safety, Dependability - Complete diagnostics easily identify system errors. Energy Efficient Direct Drive - Minimizes water consumption and allows for a standard garden hose feed. No High Maintenance Bypass or unloader Valves - All pressure settings are electronic. Aerospace and Defense - Removal of coatings from airplanes and rockets. Aluminum Smelting - Removal of build up in pipes and tubes, and excess build up in cells and reactors. Automotive/ Highway - Removal of paint and solder from booths, machinery and grates. Stripe removal. Chemical Plants - Cleaning chemical deposits from boilers, tanks, valves, evaporators, heat exchangers. Marine - Removal of marine growth, barnacles, loose paint and rust from ship hulls, docks, and ballasts. Oilfield/ Pipe Industry - Removal of drilling mud and cement, surface preparation for painting, testing pipes. Pulp and Paper - Cleaning of grease, oil, pitch dirt and wood pulp from heat exchangers, tubes, foundries. Railroad - Cleaning of gypsum, potash, cement and lime in hopper cars, removal of grease from tankers. Saving you money, the system does not use any high maintenance bypass or unloader valves. Additionally, the motor starts and runs to set pressure only as the operator actuates the gun trigger. The system is designed to minimize pump wear as well as power and water consumption. Maximum volume, quiet operation and free flowing fluid are achieved with the proven in-line disc valves made from specialty metals to withstand the high pressures. Versatile applications offering 5,000 PSI to 15,000 PSI of blast pressure so your operator can set the pressure he needs to get the job done effectively. VARIABLE SPEED DRIVE: Easy to use controls allow operator to set water blast pressures for various applications - anywhere from 5,000 psi to 15,000 psi. Blast pressure is automatically maintained by compensating for tip wear. 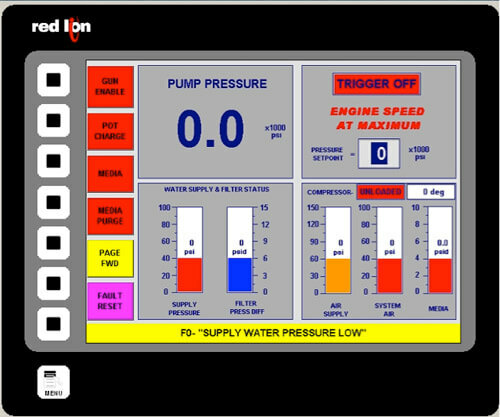 SYSTEM CONTROLS: The 8” color touch screen operator interface provides full instrumentation for monitoring and control of the system. Digitally displayed gages for high-pressure, filter differential, air supply, and water level. Uses electronic transducers and fault indicators for enhanced safety and dependability. Over the Internet diagnostic and update capable. CONTROL: System does not use any high maintenance bypass or unloader valves. Motor starts and runs to set pressure only while the operator actuates the gun trigger. This design minimizes pump wear, power consumption, and water. DRIVE: PLC controlled variable speed motor controller. Energy efficient direct drive. Utilities: Water: 10-12 GPM at 50 PSI, uses 5/8” Hose. Air: 30cfm at 100 psi. See optional: water blaster safety equipment. Saving you money, the system does not use any high maintenance bypass or unloader valves. Additionally, the motor starts and runs to set pressure only as the operator actuates the gun trigger. The system is designed to minimize pump wear as well as power and water consumption.Maximum volume, quiet operation and free flowing fluid are achieved with the proven in-line disc valves made from specialty metals to withstand the high pressures.Versatile applications offering 5,000 PSI to 40,000 PSI of blast pressure so your operator can set the pressure he needs to get the job done effectively. VARIABLE SPEED DRIVE: Easy to use controls allow operator to set water blast pressures for various applications - anywhere from 5,000 PSI to 40,000 psi. Blast pressure is automatically maintained by compensating for tip wear. Utilities: Water: 10-12 GPM at 50 PSI, fed by 5/8” Hose. Air: 38cfm at 10 HP. DIESEL ENGINE: John Deere Model 4045TF150 engine rated at 115 horsepower: comes with a 2 year, 2000 hour warranty: Engine power is transferred to the HP pump via an air-operated snap over center power takeoff (PTO). The diesel engine control panel displays all engine functions as well as starting and stopping the engine. The panel also indicates and controls engine faults and shut downs. In the case of an E-Stop condition either local or remote will also be indicated on the engine control panel screen. HIGH PRESSURE PUMP: Is a positive displacement triplex plunger pump. It is designed for long life and use in corrosive and harsh industrial operating environments. Constructed of high quality, durable metals such as heat treated stainless steel, which limits the wear and tear of critical parts and modules. The in-line valves sets are manufactured from specialty exotic and heat treated metals, built to withstand the required high pressure stresses. They deliver smooth and quiet operation with virtually any free flowing liquid. 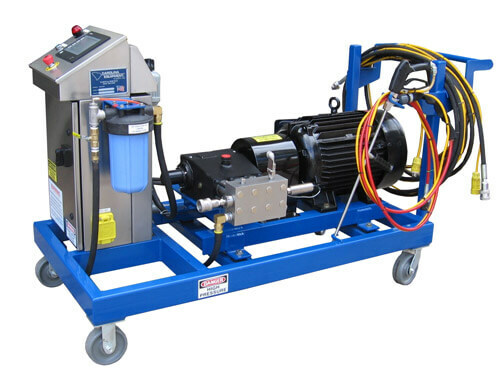 Ease of maintenance features include easily removable individual heads and cylinders - no special tools or equipment is needed.10 hp 38cfm, heavy duty rotary screw air compressor. DIESEL FUEL TANK: 29 gallon capacity: fuel level sending unit with low level shut down via the PLC. TRAILER: The entire D-115 high pressure system is mounted on 2 heavy duty 7000 pound capacity rubber torsion style axles, featuring DOT-approved electric brakes. Only the trailer style unit has step fenders the entire length of the unit. The fender brackets house LED tail lights as well as brake and turn signals: centered lifting bail: 4 corner pipe mount swivel jack stands: removable tongue. Open access trailer has 15” Wheels. WATER TANK: 50 gallon capacity: Float-operated filler valve: in tank low water float switch. FILTRATION SYSTEM : A single 30 micron high capacity bag water filter with standard garden hose thread fitting: A single 2 micron bag filter in a closed loop between HP pump and water tank. SHOCK MOUNTED FRAME: The air compressor, engine and pump frame is shock mounted to unit base removing vibration to the rest of the unit. Utilities: Water: 10-12 GPM at 50 PSI, fed by 5/8” Hose. Air: 38cfm at 10HP. Rubber water blast hose is commonly used in mining, chemical production plants, or petroleum producers. Tools intended to be used for ultra high pressure (UHP) applications. Learn what water sand blasting is and what is it used for. Water blasting is perfect for cleaning pipes and tubes without damaging them.